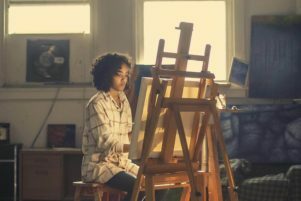 When staring off in the world of traditional art, one thing that quickly becomes apparent is the cost of art supplies. In all the popular mediums, you will often find supplies intended for two main levels: students (i.e. beginner) and professionals. While there are nuances between these two categories that are worth the price of admission, if you are still learning, there is no reason to pay a premium. In this guide we wanted to go over acrylic paints, specifically we wanted to cover those acrylic paints that tend to be a bit cheaper than the rest yet still deliver great results – like the Liquitex BASICS. But beyond covering a few acrylic paints, we also are going to show you a few trademark signs to look out for when selecting a paint, and how you can get the most out of your new acrylic paints when they arrive at your door step. The biggest difference between student and artist grade paints will be the ratio of acrylic polymer and pigment. Cheaper acrylic paints will have a higher concentration of acrylic polymer (which acts as a filler) and less pigment. Artist grade paints on the other hand will have a much higher pigment load. Artist grade paints will be a bit more vivid and have a much more even consistency when compared to their student grade counterparts. When starting out with acrylic paints – artist grade paints will be a waste of money. So, don’t feel like you are forfeiting a whole lot by opting for something that is a bit cheaper in price. Note: There are other differences between both artist and student grade paints including lightfastness, permeance, pigment source, etc. However, we feel this goes outside the scope of today’s guide. Should you want to learn more, check out our review of the best acrylic paints, where we explore all these details and more. When it comes to comparing the acrylic paints in the market, price can be a bit tricky. Most affordable acrylic paints come in sets, however, with some nicer brands, you can purchase them individually as well. We found that the best way to compare them from a cost perspective was at a price per milliliter. This way, no matter the cost of the set or the bottle on an individual basis, you are able to see how much you are truly paying for each milliliter of paint. The amount you end up paying for acrylic paints will largely depend if you go with a set or purchase them individually. Purchase a set initially, but from a brand that also sells their paints independently (i.e. like Liquitex, Apple Barrel, etc.). Given that these paints are going to be aimed at student level artists, the results expected should be tempered. As we eluded to in the quality section above, cheaper acrylic paints will have a lesser pigment load which translates to marginally duller results. But if this is your first-time diving into acrylics, this won’t likely be missed at all. Instead these paints are intended to help you improve your technique, define your style, and generally get comfortable with this fun medium. The one acrylic paint that stood out head and shoulders above the rest was the BASICS line by Liquitex. A perfect entry into the world of acrylic paints, the Liquitex BASICS line has all the essential colors you need to get started. With 48 (22 ml) tubes included, you will be able to still have vibrant results in your artwork. But unlike many of the other popular sets within the marketplace, what we really loved about Liquitex was the ability to purchase the tubes independently as well. So, if you find yourself trying to recreate Starry Night and depending heavily on your Ultramarine Blue or Cadmium Yellow Medium Hue a bit too much, you can restock easily. 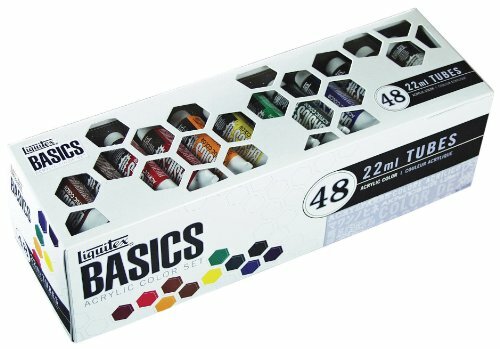 Here’s a listing of all the Liquitex BASICS products sold individually. What’s better, is that should you want to learn more about the permanence, lightfastness, consistency, and other details about the paint – you can find that all on the Liquitex site – this is unprecedented for student grade acrylics. When looking at the price of the Liquitex BASICS set we reviewed and given all the advantages that this set has over all others – we think it is rightly priced. At $.03 per ml – it’s right in the center of budget acrylic paints and shouldn’t hurt your wallet at all. Overall, if you want an acrylic paint that not only performs well, but can be restocked easily, then it doesn’t get any better than this offering by Liquitex. One of the most popular acrylic paints on Amazon is also one of the cheapest that you can find. At $.02 per milliliter, artists that are on a highly restricted budget will love this paint by Apple Barrel. 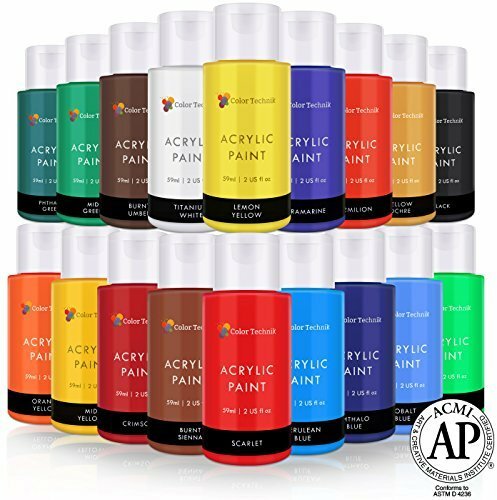 These acrylic paints are non-toxic, fast drying, and go on silky smooth – making them not only perfect for paintings, but for craft and hobby work as well. However, this couldn’t be further from the truth. Apple Barrel paints have been around since 1976 (parent company is Plaid) and are active contributors to the American Cancer Society, the Gwinnett County Women’s Shelter, Children’s Healthcare of Atlanta, and the United Way (source). Another terrific part about this set that we loved is that like the Liquitex BASICS, Apple Barrel sells their paints individually as well. So, if you need to restock on a particular color that you heavily use, expect to pay a modest price. 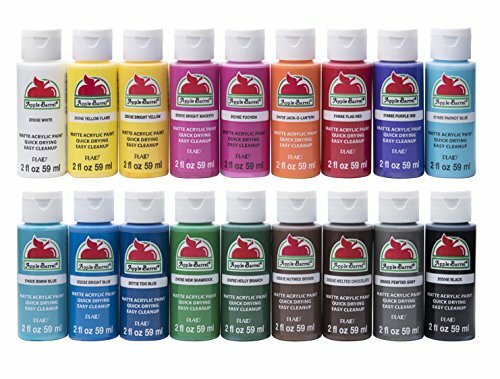 Overall, if you want to get your starter set of acrylic paint from a company that makes their products here in the USA, provides a great paint at a rock bottom price, and does good in the community, check Apple Barrel paints out – you won’t be disappointed. 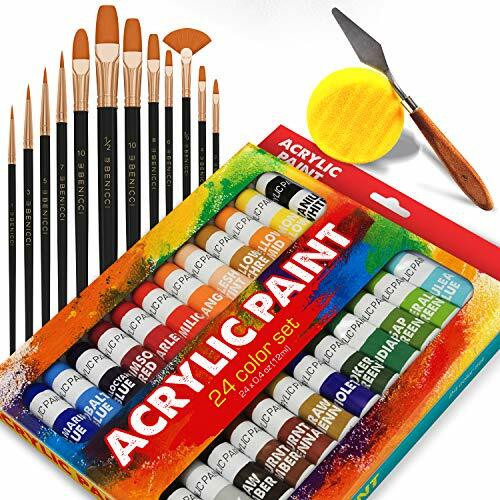 Whether you are looking for a gift or want a simple acrylic set to get you started, this set by Castle Art Supplies is an all-around solid pick. With a moderate price of $.03 per milliliter of acrylic, it nearly rivals the Apple Barrel acrylic paint we also reviewed. However, unlike the Apple Barrel set, this one does come with a nice set of trays to keep all the 48 included paints easily organized and accessible. Namely around the restocking the individual paints. We checked both major art retailers and the Castle Art Supply website itself and couldn’t find any individual paints listed. So, once you do work your way through a tube, you will have to go with one of the other brands we covered (i.e. Liquitex or Apple Barrel) for additional paint. Restocking aside, artists loved the vibrancy of these paints as well as consistency. It was able to provide reliable results across all 48 colors. And if you find that your paints aren’t up to snuff, Castle Art does have a pretty gracious no questions asked return policy if you aren’t happy at all. Overall, for budget minded artists, this set by Castle Art is perfect for just starting out and gift giving. The wide array of colors will deliver vibrancy in all areas of your work. With a thick consistency and vibrant colors, this set by Color Techknik delivers a quality paint at an extremely affordable price point. In this set of 18 different colors (in 2-ounce bottles), you can really let your artistic instincts run wild and paint medium or large-scale pieces. Now sure, the 18 colors may be a bit limiting to some, but the high pigment load in these paints will ensure that they won’t become terribly dull when mixed with others. But it wasn’t just the large bottles or paint consistency that artists loved about this set of acrylics, they also really loved their versatility and fast drying nature. So, if you want to go beyond just a canvas surface and use these on ceramics, pumpkins, glass, fabric, paper, clay, etc. – these acrylic paints should be able to perform beautifully. If there was one drawback around these paints, it would be their restocking. Like the Castle Art Supplies we also reviewed, these cannot be purchased individually. So, once you run out of a single color, you will need to purchase from another brand (which will make for inconsistent color results). But beyond the restocking constraint, these paints do come with a 1-year satisfaction guarantee – and is among the best we found in our research. Overall, these are terrific for beginners. Their ample size is more than enough to get you started and won’t require a restock after a single painting. These are among the cheapest acrylic paints money can buy. Paint company Arteza has been serving up artists with a wide variety of essential supplies for years. This beginner friendly art supply company has put together the perfect paint set for kids, hobbyists, and first-time painters. In fact, of all the paint sets we reviewed in this guide, this one by Arteza had the most variety – with 60 different colors included. While the bottles are rather small (22ml or .74oz), especially when compared to the Color Technik and Apple Barrel tubes we also reviewed, the variety is perfect for delivering vibrancy throughout your entire piece. Now, this set does come at a premium, especially if you are looking to save money. With a price of $.04 per milliliter, this set is one of the priciest offerings on our list. So, if you are willing to shed a few extra bucks for variety its worth considering, but if you want to save money on acrylics and don’t mind doing a bit of manual mixing of your paints in your studio, then we would recommend looking at a few others we reviewed. Overall, with this set from Arteza you are not only paying for variety, but quality as well. It’s a perfect set if you plan on painting only occasionally or are looking for a great gift for an aspiring artist just starting out. …and this set by Benicci helps to guide you along the way. 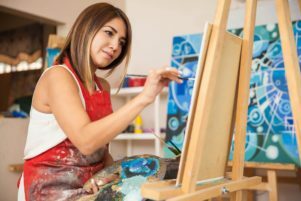 Not only will this make it easier to dive into the world of acrylics, but the addition of the sponge and palette knife will allow you to easily mix paints and employ new techniques you otherwise probably wouldn’t attempt until much later on in your art career. But as great as the extras may be, our primary concern about this set was the quality of the acrylic paints themselves. 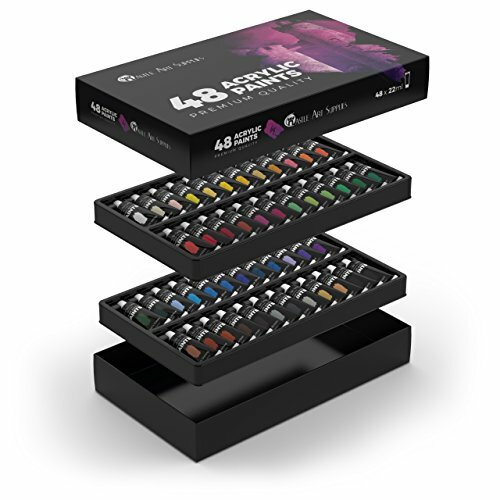 The 24 different colors are diverse enough to make it easy to paint any subject imaginable while still getting vibrant results. Like the Color Technik, you can use these paints both in the traditional art sense and hobby purposes (i.e. wood, glass, ceramic, clay, etc.). 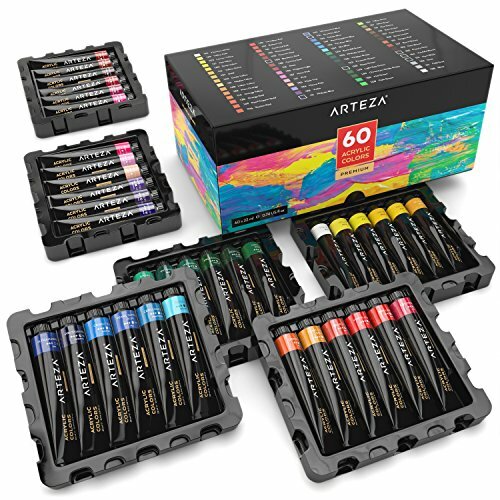 Overall, the price of these on a per milliliter basis are quite high, but the included extras make this perfect for artists entering the world of acrylics for the very first time. Can you use acrylic paints as body paint? No. 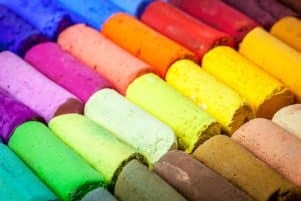 While the acrylic paints on our list are non-toxic and won’t cause adverse reactions, body paint typically uses a different binder that can be washed off easily. In addition, when acrylic paint dries, it becomes hardened. Body paint however, is still workable and won’t crack nearly as easy as traditional acrylic. Before painting with acrylics, you should you prime the surface? Yes! Before acrylic goes on any surface, we highly recommend that it is primed with gesso (learn here what gesso is). Gesso makes it easier for the paint brush to latch on to while also reducing excess waste of your expensive paint. If you are really serious about cutting corners on your budget, get gesso and apply it before painting – you will be happy with the amount of acrylic paint you save by not having it absorbed into the surface. What can acrylic paints be used on? One of the lovely parts about acrylic paints will be there versatility. Whether you plan on painting in the traditional sense (i.e. canvas or wood panel) or want to add a splash of color to some crafts, this media can be used virtually anywhere. Unlike an oil painting that can be reworked for days a later, acrylic can dry within an hour after application. This means that not only do things become permanent rather quickly, but if you aren’t careful, you can also destroy your paint brushes as well. With acrylics you must be diligent to clean your brushes properly in order to ensure their longevity. Palette Knife – Perfect for mixing, palette knives are an indispensable tool in order to get consistent color results from your acrylics. Coming in a variety of shapes and sizes, artists also use these tools to create beautiful paintings directly on to the canvas as well. With a price typically under $20, they are a great addition to any studio. Check out our review of the best palette knives to learn more. Palette / Mixing Surface – While it sounds like an obvious one, it’s one of those things you completely forget about until you sit down and start painting! While a simple paper plate can help you in a bind, a proper palette or mixing surface provides better organization, and ultimately results, in your artwork. With the best palettes for acrylic only costing a few bucks – it’s a necessity you must have before you start painting. 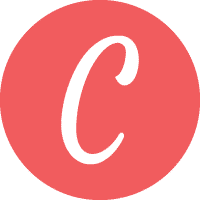 Surfaces – Canvas has been a staple surface in the art world for centuries. It’s cheap, its reliable, and most importantly it provides the best results out there. If starting out, go with canvas panels as they are a fraction of the price and still have many of the same qualities as a stretched canvas. 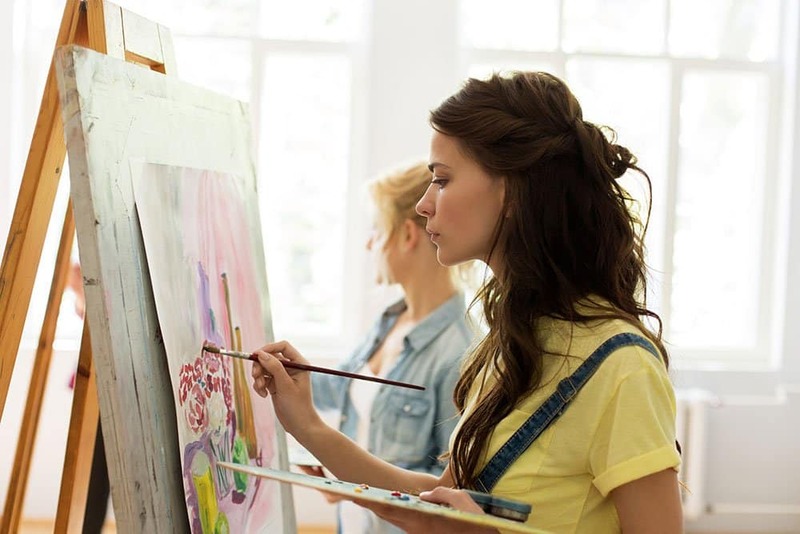 However, when you are ready to put more money towards your art budget, we recommend checking out a few of the top rated canvases for acrylics. Finding a good, yet cheap acrylic paint in 2018 proved to be rather difficult. With so many options on the market, it’s hard to not only weed through the junk, but to equally narrow the list down to the ones we reviewed in this guide. …and we think you will be too! Now if you feel that we should add any others to our list, we would love to know! Lastly, as we often say here, the amount you spend on supplies won’t make you a better artist, instead, practice and persistence will rule all. So, be sure you get out there and get painting!